Hi all, I know this has been talked about but I cannot find a definitive post. I also know that Dan has answered people before. (Top Man). From a complete rebuild, with my brother, we have refitted the pedal box and column but cannot make it all nice and tight. Reading other posts we appear to be missing the "Yellow painted clamp" from the dash rail mount. 2: Where does it fit? 4: When can you come and do it for me? 5: Alternatives? can we simply make one? is it particularly shaped? I can't find a good photo but you can sort of see it here in yellow. It gos between the thin bit of the pedal box and there's a 'bump' in the middle of it that goes into the cut out of the pedal box. Edited by wile e coyote, 03 February 2019 - 09:56 AM. Somerfords sell them, or at least they did a few months back. 21A2466. Edited by Swift_General, 03 February 2019 - 10:01 AM. +1 for Somerfords. I bought one from there last year. Didn't cost much. Mine doesn't have shear bolts there ! Alex, top job thank you. we had started to think that the pedal box was bent or put back incorrectly. We couldn't see that the two were offset and thought that it should all line up. I have part 14. the top angled plate with captive welded nuts. I shall get onto Somerfords and purchase the clamp with folding beer tokens. Thanks again to all posters. 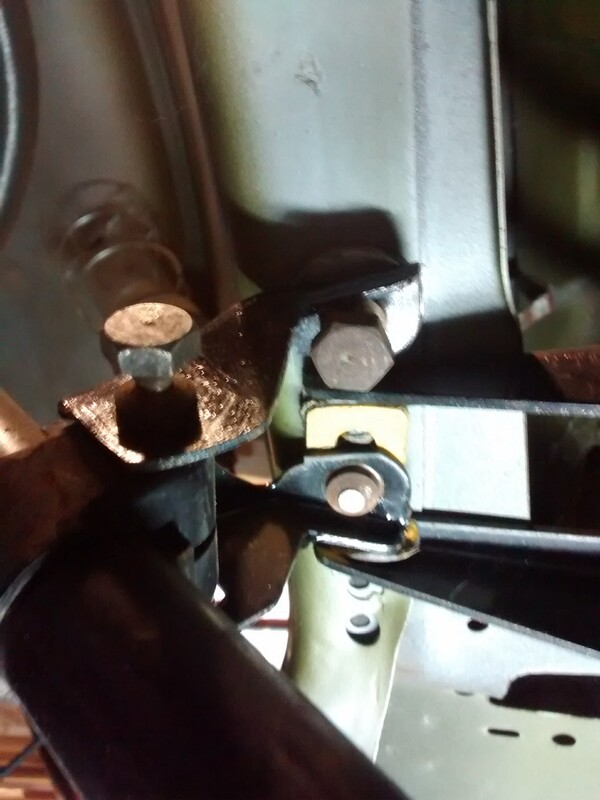 You'll also need a spacer/washers for the other side of the steering drop bracket. You can see them in the above photo.